The White House, a Greek revival-style mansion built in 1840 by former Belfast mayor John Patterson White and listed on the National Register of Historic Places, will be auctioned off at a public sale scheduled for 11 a.m. Tuesday, Jan. 28. 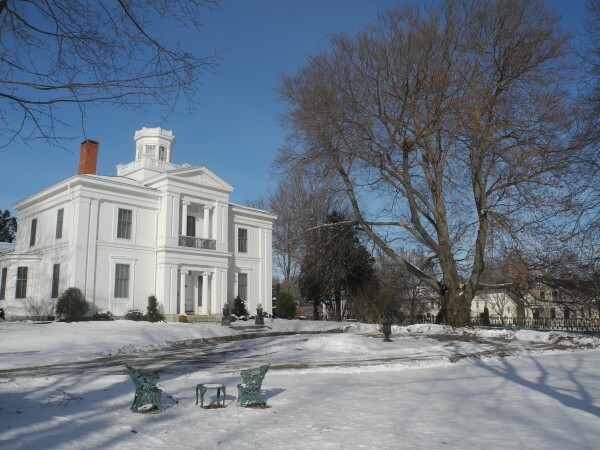 BELFAST, Maine — The local version of the White House was built in 1840 and boasts marble fireplaces, spacious rooms and the oldest copper beech tree in Maine on its manicured acre of in-town land. When the imposing home at the corner of Church and High streets in Belfast was most recently listed for sale, the then-owners were asking for more than a million dollars for the graceful Greek Revival mansion that was placed on the National Register of Historic Places in 1973. However, The First, N.A. bank foreclosed on the property late last summer, and it now is scheduled to be auctioned off at 11 a.m. Tuesday, Jan. 28, at 19 Church Street, Belfast. But it’s not likely that the former White House Inn can be bought for a song. The deposit to bid is $10,000, according to a Dec. 19 notice of public sale, and 10 percent of the bid amount must be submitted within five days of the auction. Lois Lengyel of Legacy Properties Sotheby’s International Realty, said that she had the listing until the foreclosure against former owners Diana and Santiago Rich was finalized. Efforts this week to contact the Riches, who now live in Washington, D.C., were unsuccessful. A post from March 2013 on the Facebook Page for the White House Inn told friends that the building was for sale. “Diana and Santiago had a wonderful time in Maine running this inn for four years; but time to turn the page,” it stated. According to documents filed at the Belfast Registry of Deeds, Rich Enterprises Holdings LLC had borrowed a total of $875,000 from The First, N.A. in January, 2009. According to the terms of the mortgage, Diana and Santiago Rich were bound to pay the bank more than $5,000 each month. In November 2012, they were notified they were in default, and by the next January, they owed the bank nearly $850,000 in principal, accrued interest and property maintenance fees. Also in 2012, the city of Belfast placed a $7,000 lien on the property for nonpayment of taxes. The city assesses the land and building at $688,000, with about $14,000 in annual property taxes. Belfast City Planner Wayne Marshall said Tuesday that the mansion is located in one of the community’s most protected zoning districts. Allowed uses in the district include a single-family home, a duplex, a bed and breakfast as a home occupation, or a school, he said. Several months ago, a potential buyer’s agent asked his office if it could be turned into a restaurant. After he told the agent that wasn’t possible under current zoning, he did not hear from the potential buyer again. Marshall said the city successfully worked in 2000 with the previous owners to create more flexibility with rules governing bed and breakfasts. For instance, Belfast allowed certain bed and breakfasts to hold special events, like weddings, or to serve meals other than breakfast by reservation only. Lengyel said that the real estate market right now is sluggish for sellers. For more information about the public auction, contact seller’s attorney Jacob Manheimer of Pierce Atwood LLP, at Merrill’s Wharf, 254 Commercial Street, Portland, ME 04101, by telephone at 791-1338 or email at jmanheimer@pierceatwood.com.